Ensuring the highest quality standards of medical practice in Pakistan is at the heart of the vision of the College of Physicians and Surgeons of Pakistan. Training, continuous professional development, audit and evidence based medicine are fundamental to the achievement of this aim. 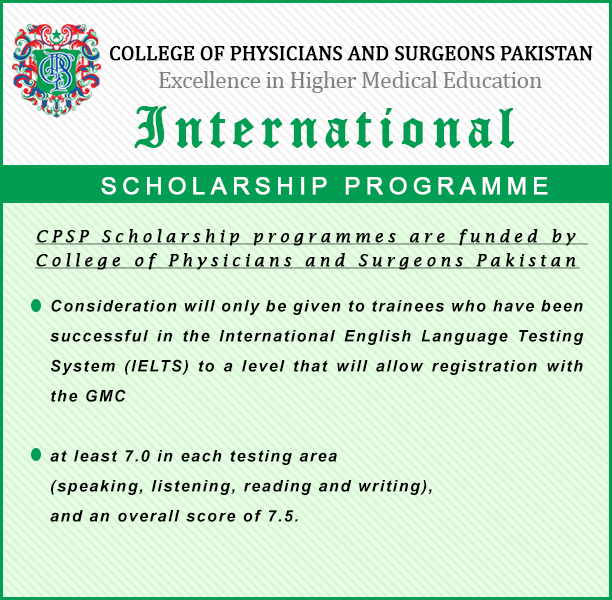 CPSP believes that international exposure of a doctor during his/her postgraduate training will help deliver this vision. Many fellows and senior fellows have benefitted from the training they have received abroad and have formed life-long relationships. The Dudley Group NHS Foundation Trust is one of the prime university teaching hospital trusts in England and holds an international standing for postgraduate training in healthcare. UHB is a leading teaching hospital in the United Kingdom and CPSP has inspected and approved these positions to ensure that they provide hands-on training. Leeds Teaching Hospitals NHS Trust (LTHT) invites dedicated and engaged applicants from the College of Physicians and Surgeons Pakistan (CPSP) to take up the opportunity of a lifetime and apply to join our team for a two year scholarship. The HEY International Fellowship Programme is a high quality training programme and trainees on these clinical placements are supervised by a clinical supervisor and their training is overseen by an educational supervisor. The Dudley Group NHS Foundation Trust is running an innovative International Fellowship programme at Junior and Senior level on a fixed-term basis for 2 years. Walsall Healthcare NHS Trust provides local general hospital and community services to around 260,000 people in Walsall and the surrounding areas and CPSP has inspected and approved these positions to ensure that they provide hands-on training. The College of Physicians and Surgeons Pakistan has entered into an agreement with the HSE (Health Service Executive) and the Forum of Postgraduate Training Bodies in Ireland to offer a postgraduate scholarship programme.